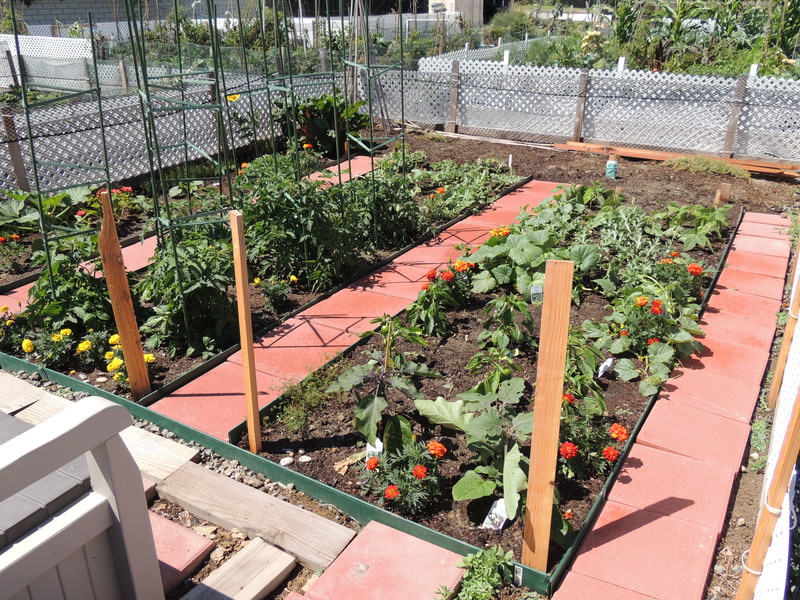 Posted on July 31, 2012	by Lou Murray, Ph.D.
Man, is this ever a busy time in the garden. Make that gardenS. With three raised beds in back, three in front, a driveway full of grow pots, AND my community garden plot, I’m feeling overwhelmed this time of year. My home garden is winding down, but my community garden plot is just ramping up. I really like being able to spread the harvest out. 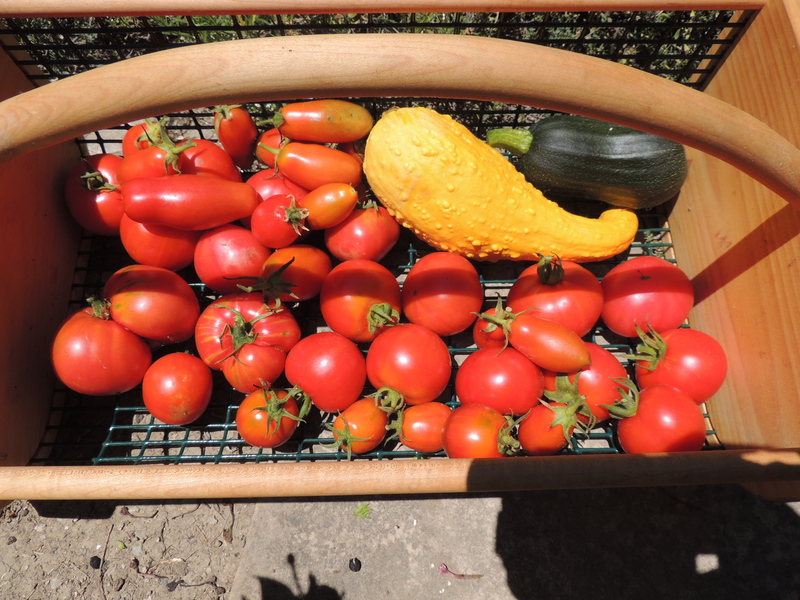 One day’s harvest of tomatoes, and yet another yellow squash. I have piles of tomatoes everywhere on the kitchen counter, waiting for me to find time to make spaghetti sauce. I think if I see one more tomato, I’m going to scream. And yet when I looked out there this morning, there were even more tomatoes ready to harvest. Do you think that 15 tomato plants might have been a bit overly ambitious? And the additional six at the community garden aren’t producing yet. This is going to be a long summer, tomato-wise. 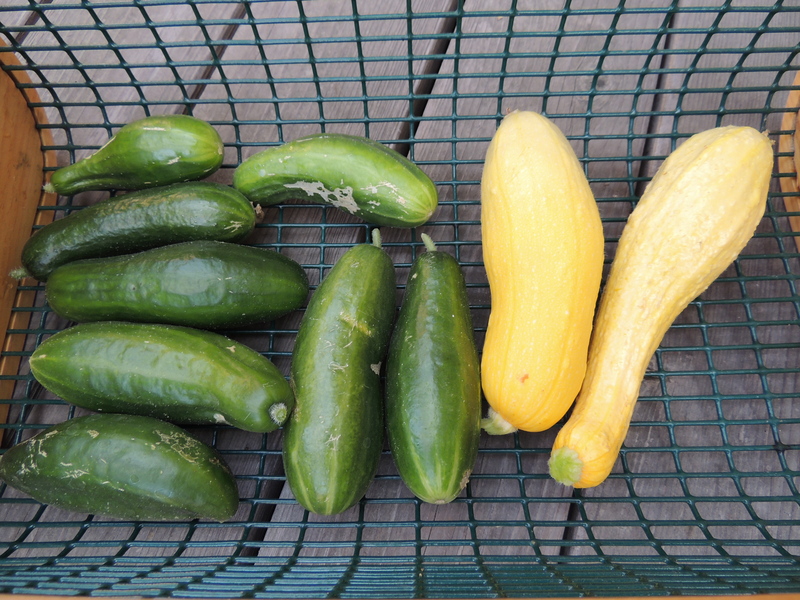 One day’s harvest of cucumbers, and yet more yellow squash. After I get the spaghetti sauce started, I need to turn those cucumbers into pickles. This is a very busy time in the kitchen as well as the garden. 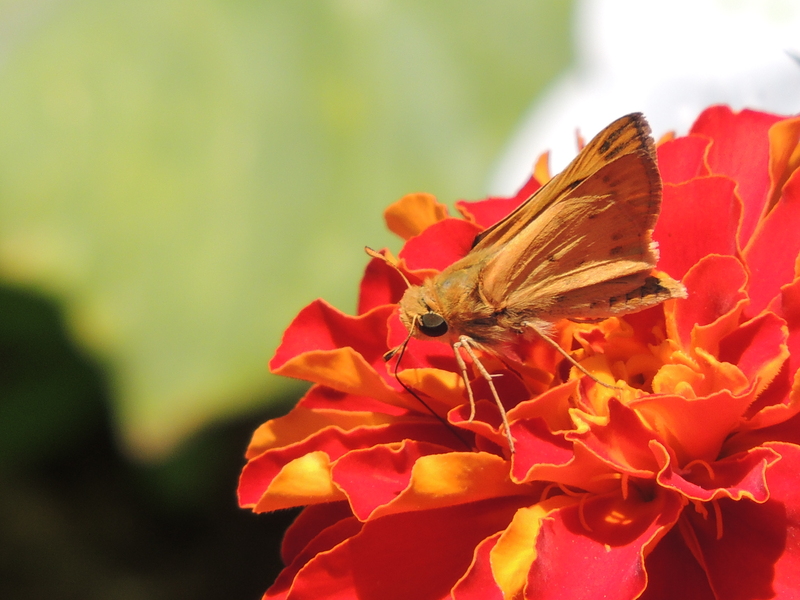 Skipper on a marigold. 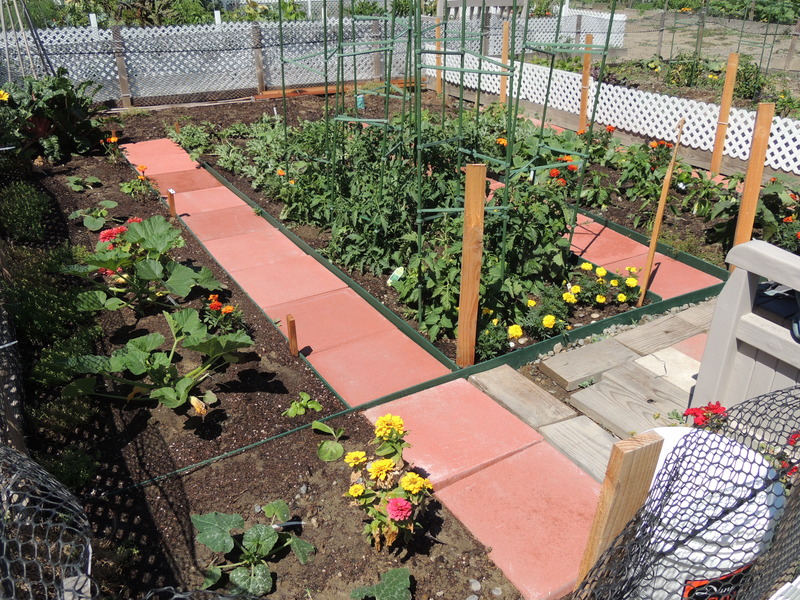 An organic garden produces beauty in addition to food for humans, and benefits nature. Look at how my plot at the community garden is doing. I’m really pleased with it. My community garden plot, looking NW. Meanwhile, those weeds keep growing and the garden needs water. It doesn’t rain here in southern California from April to November, so my vegetable gardens are totally dependent on me for water. Sadly for my garden, I have a busy life and don’t get to hand watering as often as I would like. We have no automatic sprinklers. Male flower on my watermelon vine. 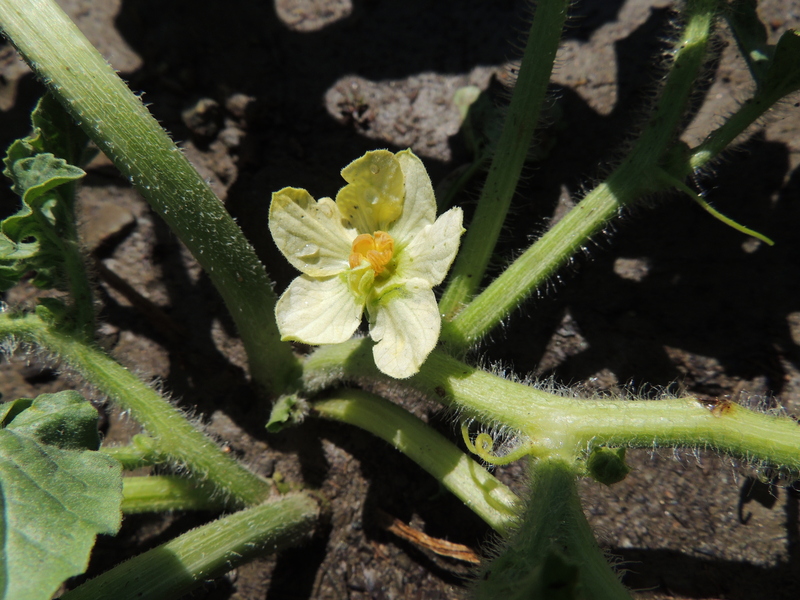 So far, I haven’t seen any female flowers on the watermelons, but a Hale cantaloupe appears to have set fruit. 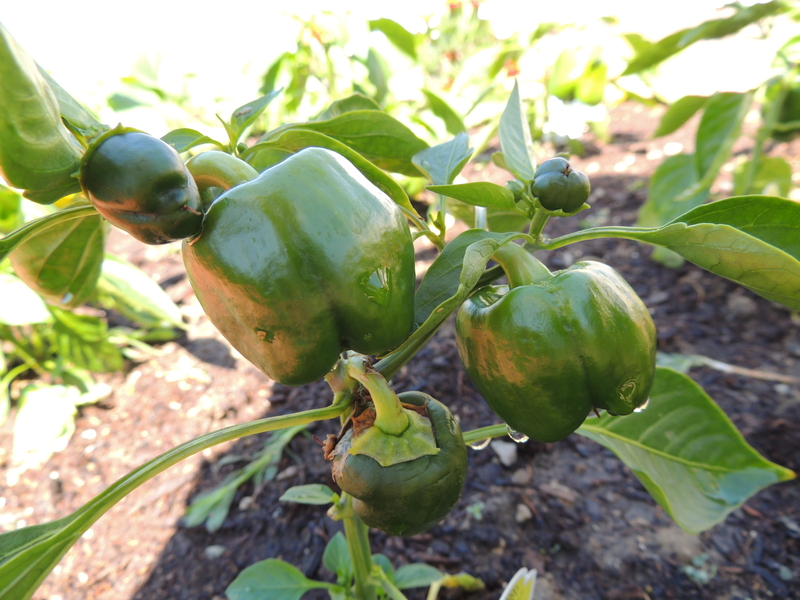 It is looking like bell peppers will be the first crop to be harvested from the community garden. Add four eggs from our hens, and this made a nice breakfast for us. 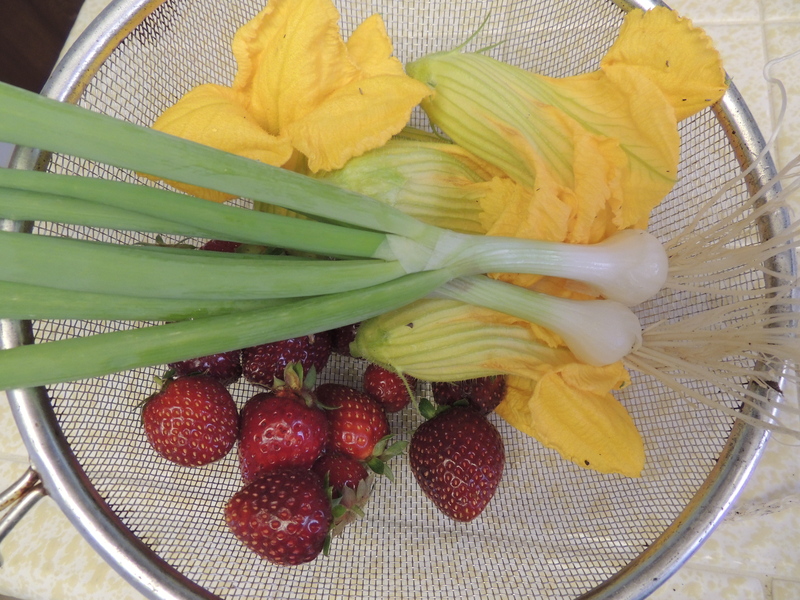 Squash blossom scramble with green onions, with strawberries from the garden on the side. Wow! What a tomato haul! Tool Lady believe one can never have enough tomatoes, and while I love to eat them, they are kind of beastly to grow, take care of, harvest and…well everything else 😉 We’re far from ready to begin harvesting cukes, though, so yours look especially wonderful! Happy canning! Bee Girl, I have staggered my home and community garden plots this year, so I’m hoping for a staggered harvest as well. Beautiful harvest. Right now I’m not overwhelmed by anything. Too bad. Sometimes it is good to be overwhelmed. I love this time of year, when all that hard work in the spring months finally starts to pay off. I can almost taste that squash blossom scramble, and those tomatoes are beautiful!